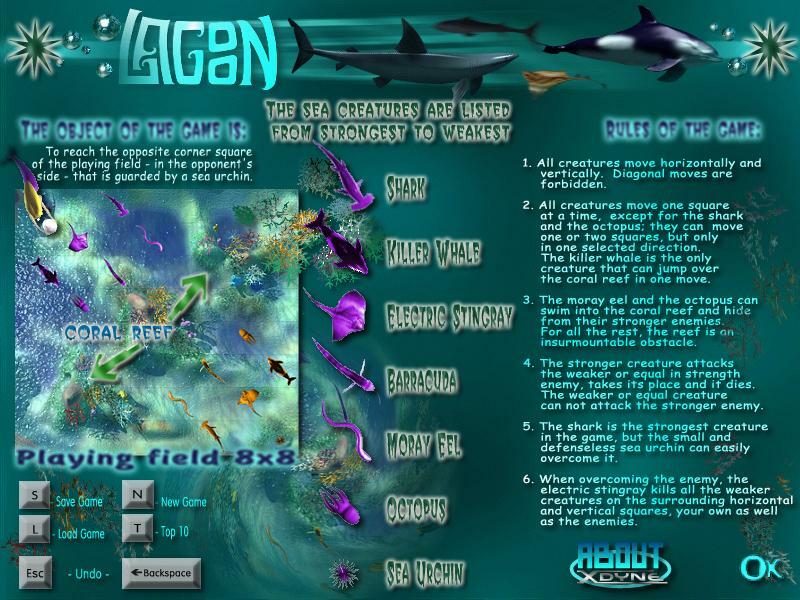 Swim into a sea of contradictions as you drift into the shimmering blue,crystal clear waters of a peaceful Lagoon and join an army of deadly sea creatures in a perilous war of survival. A ferocious shark, a prowling killer whale, a quick and lethal octopus, join forces with other fatal inhabitants of the deep to engage in a dangerous last fight. Lead one of the sea armies in their duel to the end. It's a pleasure to play and double pleasure to win! Wonderful coral islands exist among crystal clear ocean waters, far from noisy,hectic cities, but don't let the calm seas fool you! Fish, mollusks, and exotic sea animals are sovereign masters here. A ferocious shark, cautiously fears a tiny and weak sea urchin, who can be his deadly enemy. The proud and lurking killer whale can soar over the reef in one stroke,while the weak but nimble octopus vanishes into the reef, then impetuously rushes forward - to attack! The electric stingray, on the spur of the moment, kills anyone around. All these creatures of the deep have gathered together, to play a fateful part, in the last fight. Try your strategy skills and lead one of the sea armies in battle and fight with the like army of the enemy. It's a pleasure to play this underwater board game, that is as complex and fascinating as Stratego. But to win the game is to gain double pleasure, because the opponent is the deadly enemy of artificial intelligence! Are you smart enough to overcome it? 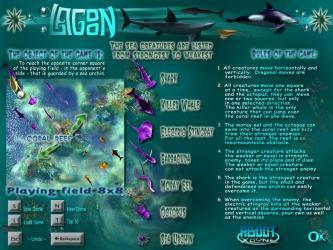 Download Lagoon and try out the beginner level to start.